Thank any and all deities around the globe, the election is over. No more breaks during Jeopardy or reruns of Everyone Loves Raymond filled with backbiting political commercials. Oh sure, they make for a good drinking game, but we’d all be in Rat Pack Heaven along with John Bonham, Bon Scott, and Keith Whitley sipping on spirits if we played in any such contest. It was just too much. Am I surprised by the election outcome? Although I am amazed that everyone happy with the Presidential election outcome seems to think that we all have swallowed a magical pill. They seem to think that the time-released active ingredient will kick in about mid-January and every problem will be solved, dogs will talk, and everyone will be able to bend steel. I tend to stay away from political ramblings because there’s enough of that out there already. I’ll admit that my blog doesn’t really have anything that “matters” within its bowels. It’s because there’s enough of that kind of crap out there. 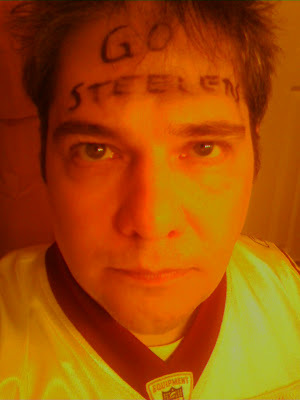 I would rather write about losing a silly football bet with Beaverhausen where I had to walk around all day Tuesday with “Go Steelers” written across my forehead after my Redskins lost on the night before than spit out my opinions on politics… Or homelessness… Or health care… Or whatever. Another great thing about the Presidential election being over? Obama supporters can now shut the F up and get ready for the finger-pointing in their direction. The economy is screwed up and the ones that screwed the pooch want us, the taxpayers, to bail them out. Wall Street, car manufacturers, and home lenders are jumping on a wagon where the shock absorbers are you and me. We’ll see just how long Barack can ride his white horse into town before someone has to put that beast out of its misery. --I’m out for the weekend, kids. I’m visiting a club that I’ve been curious about for years… The Country Corral in King, NC. I’ve been imagining a place like the redneck bar in The Blues Brothers movie. I know there’s a mechanical bull and I’m expecting chicken wire in front of the band. We shall see. I’ve been told to pack a pocketknife, but I think breaking a bottle on the edge of a table for a quick shank will look much cooler. I’ll try to snap some interesting pictures for you. I hope you didn't eat the popcorn at the Corral...I've been warned about it. Not a horrible place, I just felt a bit out of place when Thirteen20 played there a few months ago; then a nice drunken redneck woman made me her best friend for the night. I ate no popcorn, but there were some very interesting people watching moments. I was also the DD, so there was no booze in my system to help me assimulate into the Corral's population. As far as I know there is no popcorn at the country corral.... people with no teeth have trouble eating things like that. I'm thinking if you have a problem with "rednecks" staying away from a place called the "Country Corral" might be a good option. There was indeed popcorn... One of the bouncers sat down a foil wrapped basket of popcorn in front of me while he cleaned the empties from our table. I guess I'll stand corrected then. Maybe the toothless put it in there beer to soften it up... you know, like peanuts in coke. BTW That is a really hot picture of you! I believe my COLTS beat the STEELERS this past Sunday... Go Colts!! WhooHoo! !